Abstract : An initial code for Monte Carlo simulation of trajectories of plasma particles is developed. Only basic behaviour of the particles is implemented. The main objective is educative due to the CPU limitations and because PIC (particle in a cell) algorithms are not implemented. 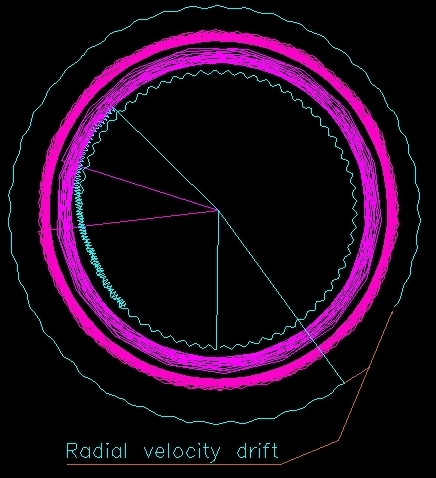 Only velocity drifts due to B gradient, centrifugal force and electrical fields are implemented up to the present . No diamagnetism and magnetic field due to the movement of the particles is implemented in this version. Different codes exist to simulate plasma particles using Monte Carlo methods so this code is intended mainly to personal educative function. Perhaps it might be useful to calculate magnetic surfaces, magnetic share, losses of particles, etc, in innovative geometrical magnetic fields. The calculations are done following the explanations in Dolan , mainly from chapter 7. Non-relativistic behaviour is considered and a pack of particles forming a quasiparticle is used. 3D simulation is produced. The interval of time per step varies between 10 and 100 picoseconds and simulations have achieved up to 1000 particles and 1 milisecond. The simulation of higher number of particles requires some kind of PIC algorithm and this falls out of the objective of the code. A file with the necessary data is created in each run. The file contains useful information of each particle for each 500-2000 steps. At the moment, the results are : cartesian velocities, velocity parallel and perpendicular to B, energy and magnetic moment of each particle. The number of particles lost outside a rectangular box of volume is also saved. Average values are not calculated yet. Particles start in a random position, all have the same T=106 K (non-maxwellian distribution), the poloidal and toroidal velocities are random values but vertical component is always zero. The magnetic field is obtained using MEMCEI v2.1 code and HT-7U tokamak as an example. However the magnetic field and size is divided by 10. Values of B are taken each 25mm forming a grid. The magnetic field at each point is interpolated using trilinear interpolation. Although a preinterpolation of the values and the use of this values stored in RAM memory has been tried, only the work with exact interpolation for each (x,y,z) point has been tested. The use of preinterpolation seems to produce excessive changes in the gradient of B and so it was avoided. The preinterpolation method is about 5 times faster than interpoling each particular point that is obtained step by step. Simulation A was obtained using 100 quasiparticles each one composed of 108 particles of identical characteristics. There are 50 quasi-ions and 50 quasi-electrons running. The simulation follow the properties and input data explained above. The magnetic field is calculated from the TF coils only, no PF and plasma current is considered. 106 steps of 10 picosecond are simulated (a total period of 10 microsecond ). Only 3 ions in blue and 2 electrons in reddish are shown in Graph 1 and Graph 2 . 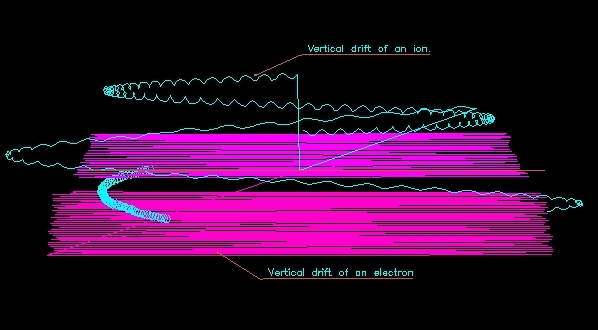 The trajectories of the electrons are graphically represented with less accuracy than ions to decrease memory consumption. 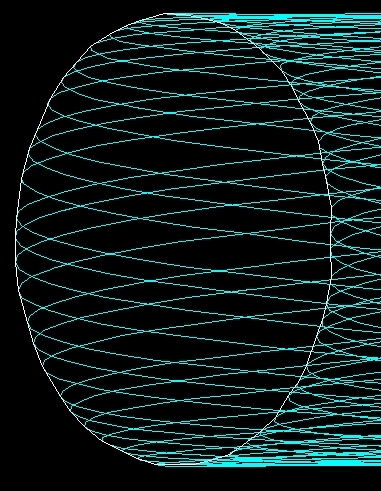 The end of each trajectory appears as a straight line towards the origin. 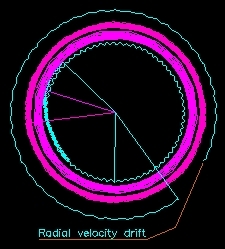 The different types of trajectories observed for ions are caused by the different parallel/perpendicular B ratios of velocities. Additionally the higher magnetic field at lower major radius and the higher electric field at equatorial points also influence on the different trajectories. No electrical equilibrium is considered so electrons drift freely toward decreasing Z values (down in the Graph 1) and ions follow Z+ paths. This can be observed in Graph 1. With this conditions the electric field increases continuously and produce a radial drift of both electrons and electrons that can be seen in Graph 2. Simulation B tries to obtain several magnetic surfaces. They are obtained using only one electron. The magnetic field includes the influence of TF, PF coils and plasma current at about the instant 13 sec. See  and  for more information about this instant. No quasiparticles are utilized. The simulation follow the properties and input data explained above. - 3 x 106 steps of 10 picoseconds are simulated in Graph 3 that is a total period of 30 microsecond . The trajectory of the electron is plotted. The magnetic surfaced appear clearly defined. The contour of the magnetic surface is highlighted in white. No further developments are foreseen. Perhaps the searching of a standard code to evaluate magnetic field configurations might be useful to select optimum coil configurations. "Fusion research" T.J. Dolan, Pergamon Press. "Profile of the forces on TF coils of HT-7U. Comparison with the results of the HT-7U team" , Vicente M. Queral . See "Present Status" or “Last results”.